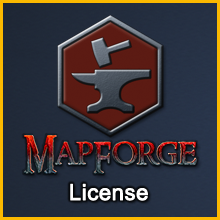 MapForge licenses are currently available at a slight discount. Although MapForge can be used without a license, export resolution in the free version is capped at 50 pixels per grid square (sufficient for use in many popular virtual tabletop programs, but not suitable for printing) unless you purchase a license, which enables export resolutions of up to 400 pixels per grid square. Maximum map size is also limited to 50×50 grid squares without a license (up to 400 x 400 grid squares allowed with a license), and there will likely eventually be advanced features that will only be available to licensed users.